Apple just announced the iPhone 8 will have wireless charging capabilities. Wireless charging is finally coming to the iPhone. Apple announced Tuesday that the iPhone 8 and iPhone X will have wireless charging capabilities. The new glass back design gives the new iPhones the ability incorporate the "Qi" wireless charging standard, allowing them to charge just by placing the device on a "mat." Two new charging mats developed by smartphone accessory makers mophie and Belkin are already available on Apple's website and in stores. As the new iPhones use the Qi (pronounced "chee") standard, other charging mats and accessories currently on the market should work fine as well. A full list of Qi-compatible chargers is available here. Apple also previewed its own wireless charging accessory called AirPower, though that won't arrive until 2018. No pricing was given. 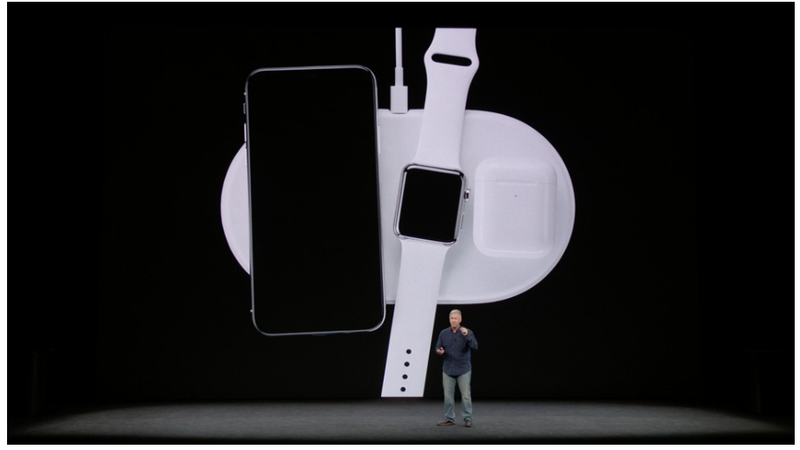 AirPower can charge up to three devices at once including the iPhone 8, iPhone 8 Plus, iPhone X, and the Apple Watch Series 3, as well as a new optional wireless charging case for AirPods. Apple spokesperson Philip Schiller said restaurants and companies will offer wireless chargers compatible with the new iPhone. Toyota, Honda and other automakers already feature the technology in some of their cars. While wireless charging is fresh for Apple devices, it isn't new to Android fans. Samsung's rival Galaxy S and Galaxy Note lines of phones, for example, have offered the feature for years including on its most recent Galaxy S8, S8+ and Note 8.